Based on the bestselling book by Caroline Alexander, George Butler's documentary The Endurance has screened at numerous film fests, including Sundance, Telluride, San Francisco, Santa Barbara, the Double Take Documentary Festival and the Hot Docs Canadian Documentary Festival. It was recently chosen as Best Documentary by the National Board of Review. Narrated by Liam Neeson, the story follows Sir Ernest Shackleton's ill-fated 1914 Antarctic expedition during which his ship "The Endurance" became trapped and crushed in the frozen Weddell Sea, stranding Shackleton and his crew of 27. 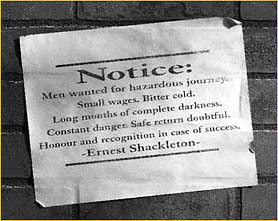 Some 630 days later Shackleton eventually managed to rescue his men -- after two great boat journeys and a monumental traverse across an unmapped glacier. Amazingly, a photographer named Frank Hurley was able to capture the trek and rescue on glass plate negatives and motion picture film. To make this documentary, George Butler made three trips to the bleak and remote location in the Antarctic, shot his own footage and edited it with the original material taken by Hurley.